St Martin’s Gate in Martin’s Lane was one of seven gates around Cathedral Close. 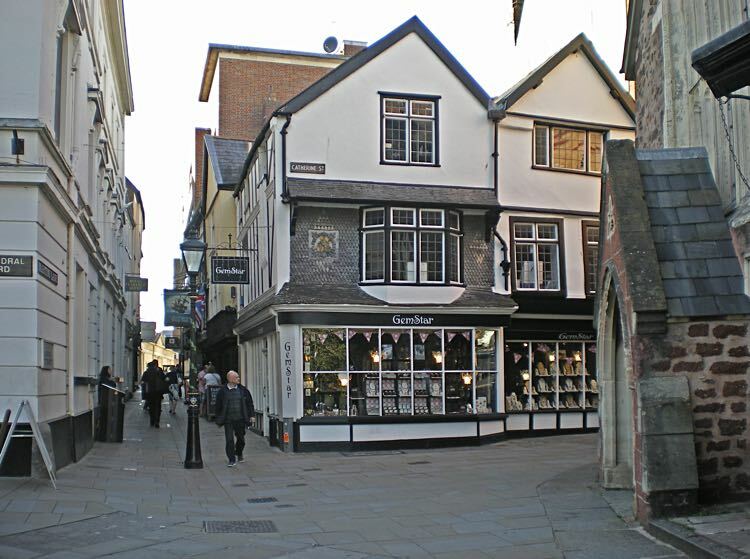 The Close was gated in 1286, after the murder of Walter Lechlade, on the 5 November 1283. 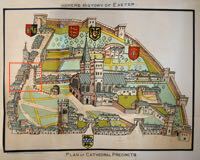 Agreement between Peter Quivel, the Bishop of Exeter and the Mayor to enclose the Close was made on the Day of Annunciation (25 March) for seven gates, including one wide gate for carts at Martin's Gate. This was so the Close could be closed at night and opened at dawn, to prevent strangers entering, and causing incidents. Most of the smaller gates were originally simple affairs consisting of a slated roof and stout, double gates, although rooms were added over some of the gates at a later date. Martin's Gate was a vaulted arch ornamented with tracery–remains of the arch can be seen on the upper wall of the corner shop. 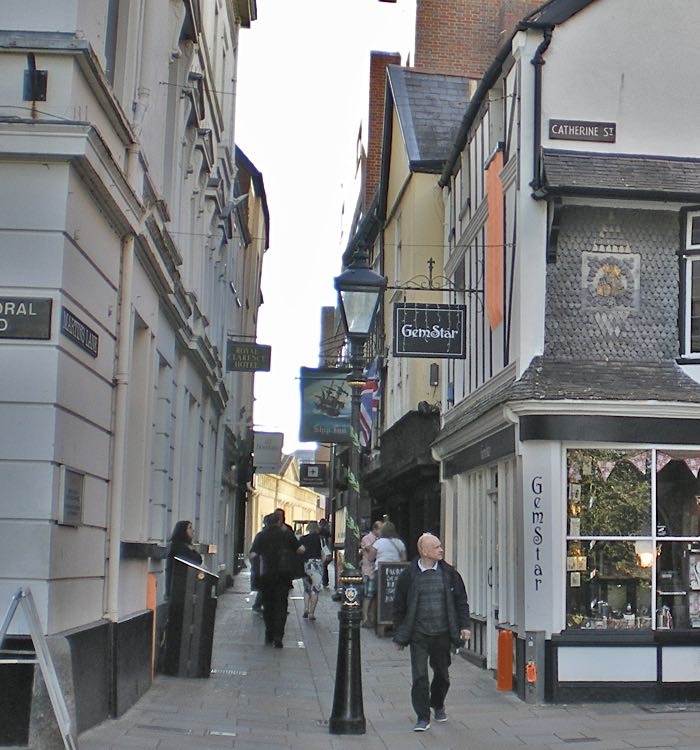 The shop was built against the gate in 1450, while the corner of the Clarence, was originally built as the Exeter Bank in 1769. 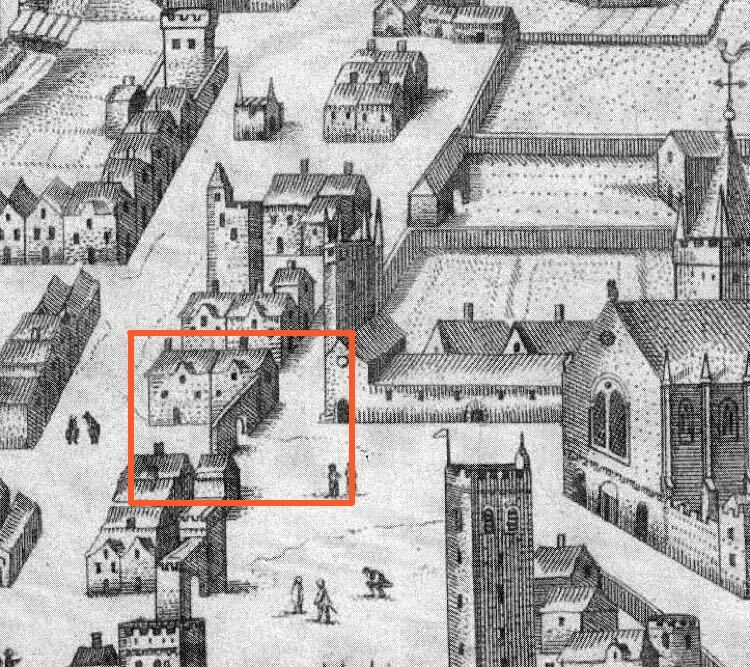 The first record relating to the gate in the Cathedral Archives, after the agreement to build it, was when the workmen James Greedy and John Hooper were paid for repairs to St Martin’s Gate and Cathedral Tower in 1685 and 1686. Another repair was made in October 1757. 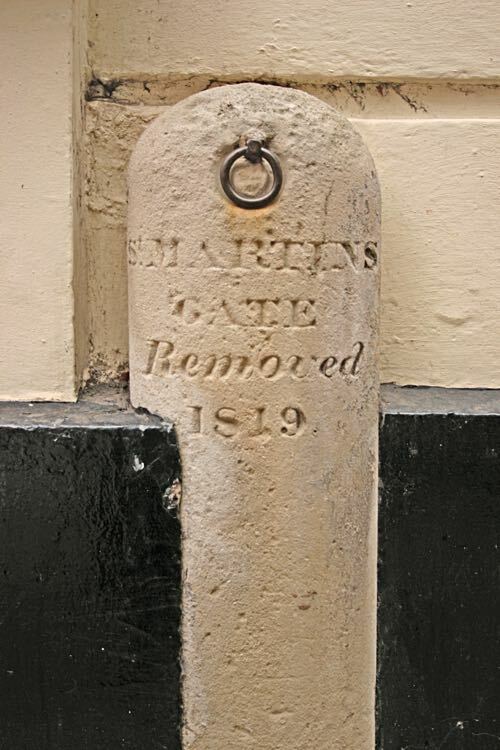 A few years later, in 1771, a new post was put up for a lamp in the roadway to the gate. 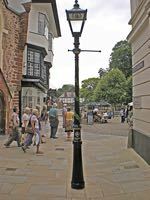 It does not say where the lamp post was, but to this day, there is a lamp post at the entrance to Martin's Lane, just inside the site of the gate. There was a gate keeper, who held the key, but following an incident in 1803, when John Risdon was paid 15s “to compensate for damage done to him by St Martin’s Gate, and they ordered the key to that gate to be taken from Mr Phillips of the Hotel.” The Hotel of course was the Royal Clarence, and Mr Phillips was the hotelier. From about 1810 onwards, the gates of the Close were removed. The turn of St Martin’s Gate came, after the Improvement Commissioners proposed the gate be demolished. A resolution to demolish on 21 August 1819 was discussed by the Chapter. The Vicars Choral occupied a room over the gate, and they were to be consulted about the removal. The Chapter were in agreement, so long as “…a flat pavement for foot passengers only” be made. The gate was removed in August 1819, during the driest and hottest weather of the previous 20 years. After the removal, on 9 September, the Chapter agreed to pay for levelling, and making good of St Martin’s Lane. Two posts, one painted black and each with a ring, was placed to mark the position of the gateon each side of the lane. 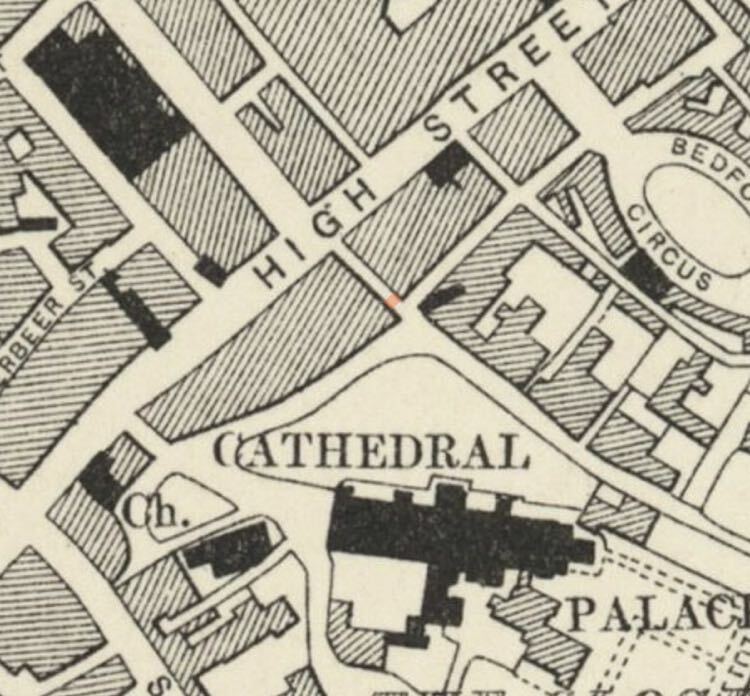 When Broadgate was demolished in January 1825, the coach service Defiance, and others serving the Hotel ran down Martin’s Lane for the two months of the work–it is interesting to speculate on the skill of the coach driver, fitting the coach, and as many as six horses down the lane. The removal of St Martin’s Gate was not the last, but it is possibly, barring Broadgate, one that would have most enhanced Cathedral Close for the tourist and local in modern times. 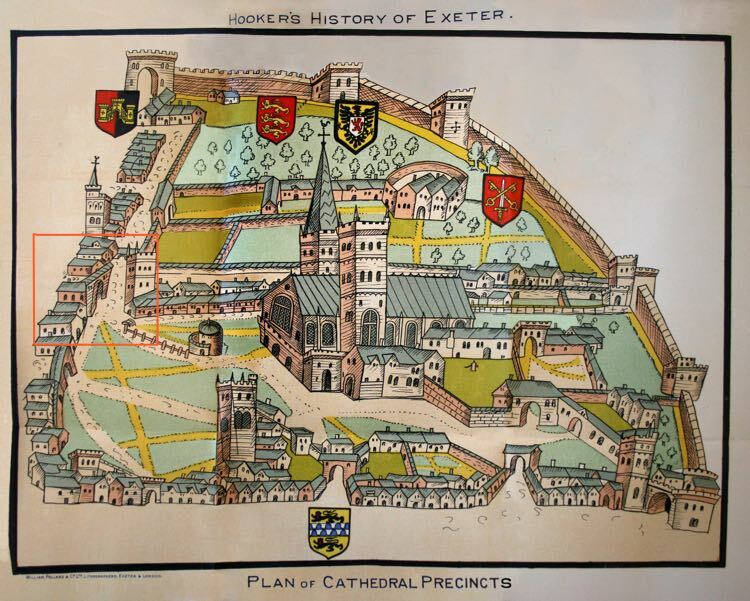 Sources: The Cathedral Archives, Devon Life, British Newspaper Archive. Gates of the Close (Civic Society) by MIchael Fodor. 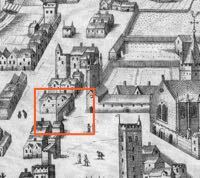 This map shows St Martin's Gate as a simple arched affair. Broadgate, below it, is more substantial. Hoker's map showing St Martin's Gate. Martin's Street from Cathedral Close. St Martin's Church is on the right. The post that marks the gate. 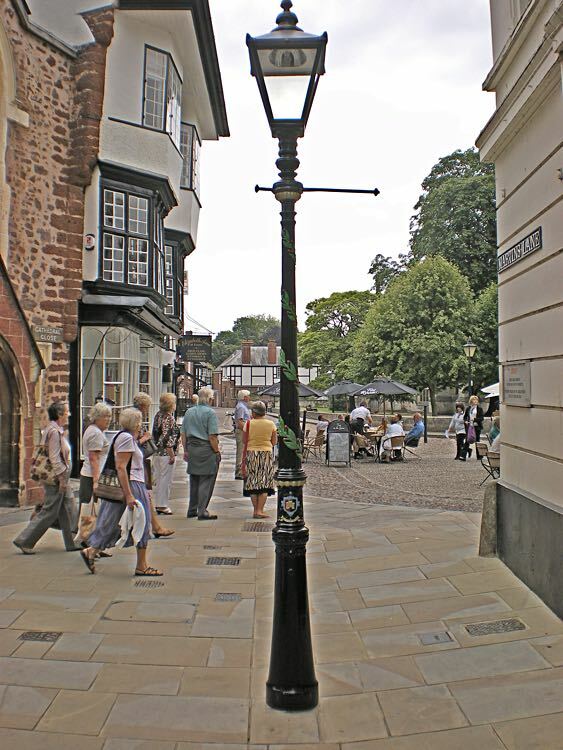 The lamp post at the entrance to St Martin's Lane. The left post is tinted red. The tinted section of building is all that remains of the original arch and the black painted post is tinted red beneath.